I needed a decent amp for my workshop in replacement of the Rotel RB981, which is not a particularly bad amp, but it has its shortcomings. I build a lot of different speakers and people bring in a lot of speakers with the all too common 85-90 dB sensitivity, speakers my SET valve amps simply can't play very loud. If only I could have some of the midrange quality of my SET amps - and 60-100 watts, I'd be more than happy. I've recently listened to a few newer class A amps like the Clearaudio 50 wpc power amp and I certainly liked what I heard. Now, 50-100 watts class A solid state amps are not the most common thing on the shelves of hifi stores and for some time I was seriously considering a 100 wpc PP valve amp of some kind, but valve amps usually requires a lot of tweaking to perform their best and for my workshop amp I felt more inclined to a plug'n-play solution and it wouldn't hurt with some solid watts that could at least try to push some life into dull bass drivers. After a lot of discussions with one of my friends, I decided to try out the JungSon JA88D amplifier, actually an integrated amp, and now in an "-09" version with a few improvements compared to former model introduced 2003. I like the fact that this amps has been marketed for a number of years and that a new model really only has a few changes based on the comments from reviews. It seems the basic design has something right and my salute to JungSon for not making changes for the sake change and pure marketing. The criticism on the -03 version was basically minor noise and hum and a slightly problematic treble performance when run at high output. It appears all these problems are gone. The volume control circuitry is probably state of the art, but the remote and the speed with which the volume control works is definitely not up to B&O standard. However, I use the Jungson with my WOT line stage and the JungSon volume setting is on steady "55", thus no problem. The JA88D-09 has excellent sensitivity and there's really no need for a line stage, but the thing is that it just sounds a tiny bit better with my WOT line stage. Maybe a little second harmonic distortion really balances the JungSon's dominant 3rd harmonic distortion making it a little less "clean", because run alone, this amp is a clean performer with an unusual transparent midrange, a solid bass and - to my ears - clean treble. Maybe they have improved on treble performance as well. This amp is HUGE! Weighing close to 30 kgs and running 2 x 80 watts class A - at least from specs. I had expected a top panel suitable for frying eggs. This is definitely not the case. Compared to my 6AS7 valves (Audio Mirror) consuming some 300 watts, this Jungson is cool. Apparently the 1.8 square meters of copper cooling panels are doing a great job of getting rid of heat. The amp draws an idle current of 0.75 amperes, making ~173 watts, although my power meter tells 80-90 watts due to the voltage/current phase shift. The MC and line stage will consume very little power compared to the output stage. So, what's the real class A rating of this amp? Go to Hedo/Duro page to get an idea. With a sound quality like this for ~700 USD (Cattylink, Hong Kong), even the thought of making some diy solid state seems pointless. We couldn't even buy the components for this price. In short this amp is awesome and must be a serious competitor to amps many times its price. (In total I paid 1077 USD incl. shipping + an additional DHL fee of 90 USD. For DK customers there may be an additional 25% VAT of the 215 USD value stated on shipping papers). Having mentioned my supplier above has caused some response from people very unsatisfied from buying gear from Cattylink. To my knowledge only Cattylink and Ornec sell Jungson equipment from Hong Kong. Whenever I buy components from Hong Kong or China I take my chances and I'm willing to loose my money. I never expect any return of goods, any warranty or whatever, so don't take the above as a recommendation of a reliable supplier. I can't tell. Use google to find out about your supplier and make up your mind if you're willing to risk your money. I searched Cattylink and found good and bad. If you're wearing belt and suspenders, I suggest buying from a local retailer. Hello, I have noticed that you have been excited about your amplifier, congratulations , good choice! 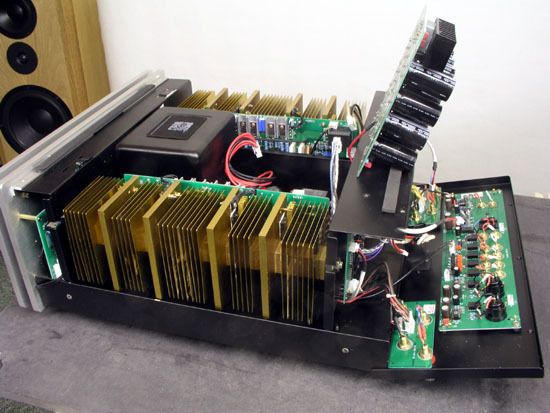 Just wanted to tell more about the history behind that amplifier and the other JungSon amplifiers...In the 90`s there was a Swedish high-end brand called Forsell. The man behind the brand was Peter Forsell, Swedish doctor/dentist who develop lot of stuff in the medical purposes. He was also interested about high-end and started to build very good equipments based on his innovations, example Forsell air reference turntable wich basically is kept off the ground with compressed air...Nice idea! I dont know what exactly happened but I think he just get bored developing more in the audio world, however, the circuitry and biasing technology were adopted then in a few brands, at least there is Adyton and Oasis audio. The brand Oasis audio were sold in the USA sometime ago and the look of those is exactly like...you can guess, same as JungSon has. I think Peter Forsell sold licenses to build amplifiers based on his circuitry for Norwegian Adyton and to the Oasis audio who then started to manufacture amplifiers in the China, Jungsons factory. 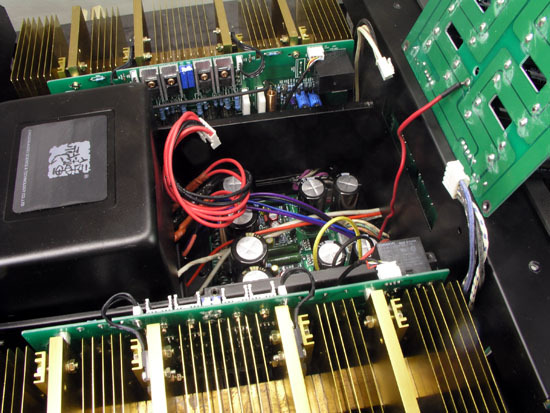 So, you basically have Forsell amplifier which costed insane numbers in the 90`s! There propably is mistakes here or there so don't get all my info too serious but just wanted to share my info :) p.s just ordered 4pcs of Eminence 10" from the Thomann...Regards, Niko. 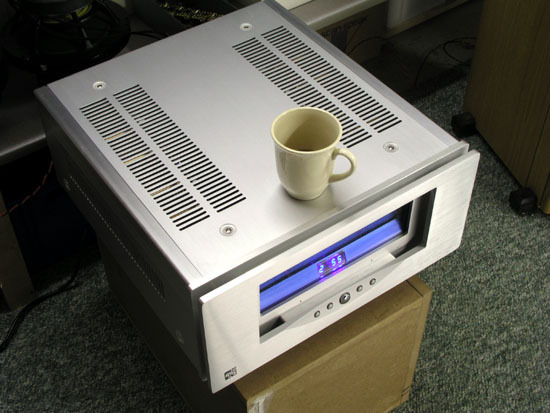 Left: Don't count on keeping your coffee warm on this amp! 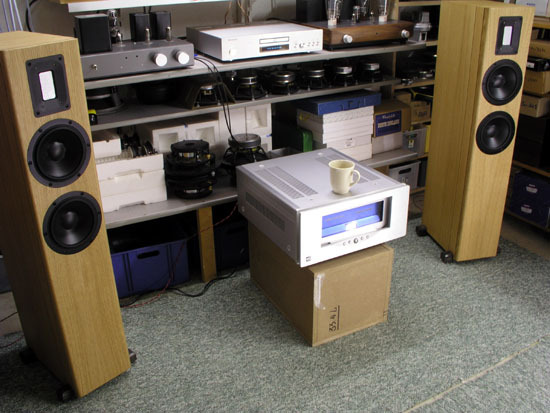 Right: The JungSon running my ATR-25 speakers in the workshop. Fortunately the amp fits well on the lower shelf behind. Left: Rear panel released and we have access to input panel with switching relays, attenuator section, MM-MC amplifier, balanced inputs and line stage. Right: MM-MC section based on two op-amps; probably not the very best RIAA the world has seen, but if vinyl is not your primary source of music, it may do well. Quite a switch for MM or MC selection! Left: Line stage encircled with white. Attenuator section encircled with red. Right: Balanced input section. 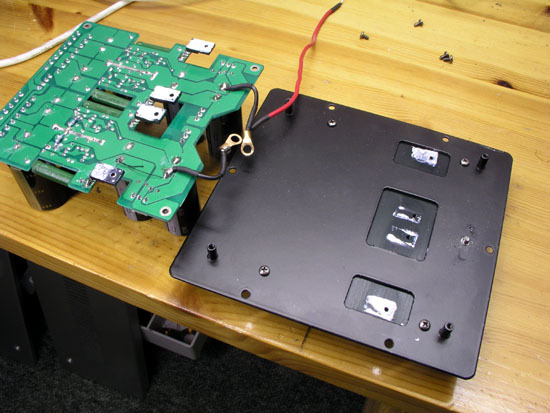 Left: Massive cooling panels and main capacitor bank removed. 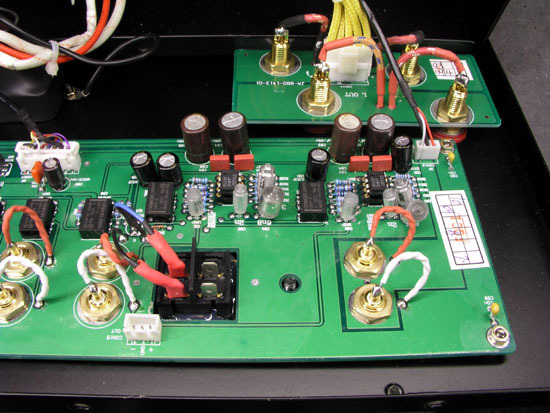 Below all the electrolytics we find a regulated power supply for the phono and line stages. 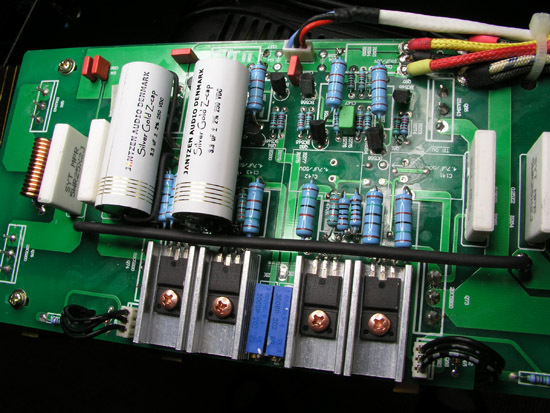 To remove the regulated PSU we have to un-solder the red wire going to the main capacitor bank. 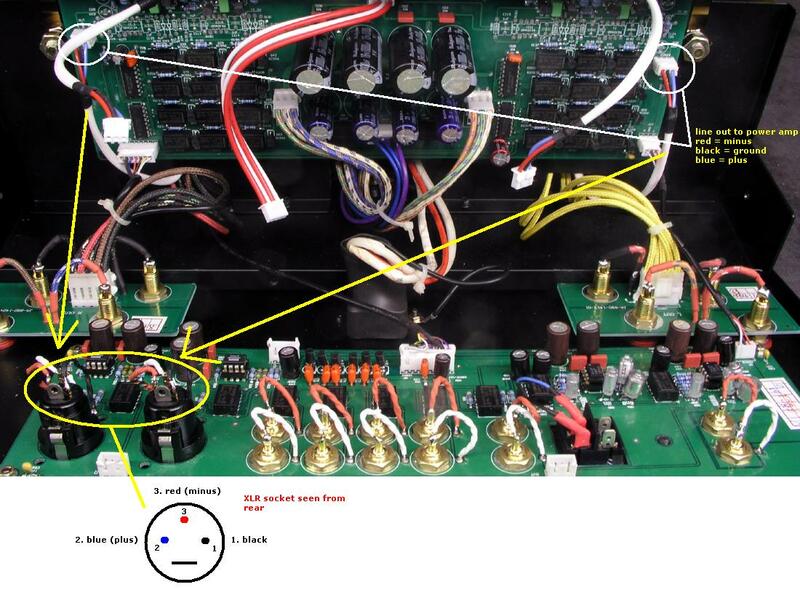 Standard XLR wiring says: pin 1 = shield (ground), pin 2 = plus, pin 3 = minus. 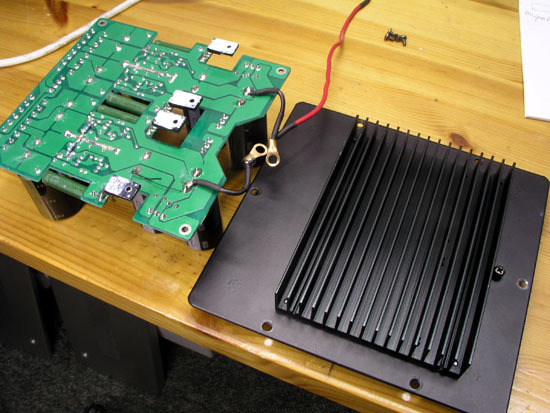 Remove all cables from XLR sockets and unsolder wires also from the circuit board. For some reason JungSon has chosen red for minus and blue for plus. Hmm... 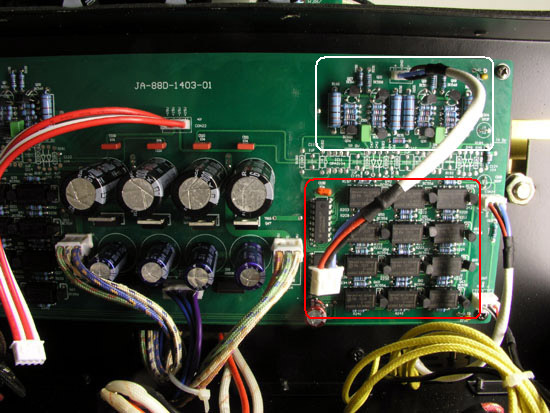 Extend wires from power amp module and connect black to pin 1, blue to pin 2 and red to pin 3. Obviously the volume control is now no longer in action and the JungSon works as any other power amp. You need two XLR plugs and running from standard RCA line stage outputs, you connect plus to pin 2 and minus to pin 1 and 3 on the XLR plug. Using the Jungson as a power amp only, I shorted the input caps. Read the Hedo/Duro file to see how. 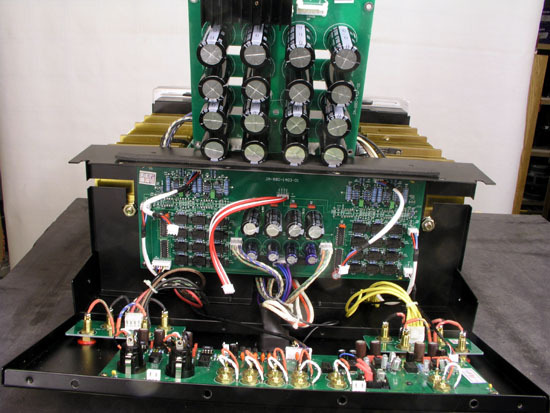 Also check the Hedo/Duro - the power section of this amp - here. Here you'll read what this amp really deliver in class A. Don't be disappointed, it's the sound that counts. After having my Swedish friend analysing the Jungson schematrics it was time to change the coupling caps between driver stage and power stage. I had already removed the input electrolytics but had been waiting for the silver-golds to arrive. 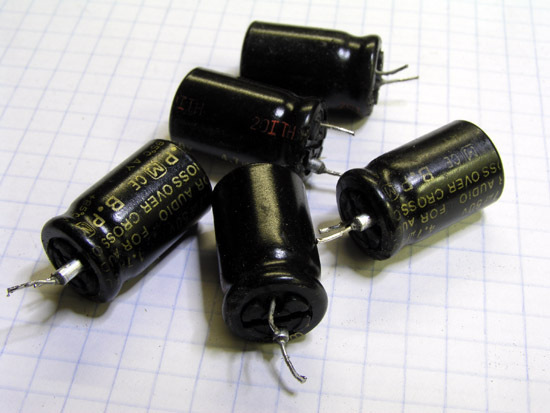 Left: Former electrolytic coupling caps. Right: Two of the new silver-golds in place. To make a long story short, you haven't heard what your Jungson/Duro/Hedo is capable of before all these electrolytic coupling caps are gone! I have a 45 rpm Denon test LP where the male chorus used to be so-and-so, not really unpleasant, but male choruses are generally trouble and we may excuse our system of not being capable of handling the extremely complex signal and think it will never really sound good regardless of amps and speakers - until we discover another bottleneck in the overall chain. The flute and generally woodwind instruments loose a bit of the shape edge in transient passages. In short, more detail, more timbre. Listening has become easier in the never ending pursuit of aural nirvana. Highly recommended. The 3.3 uF/250V silber-golds (prototypes) used here are without the alu tube and only 17 mm diameter - and whatever you use, you shouldn't use caps with a diameter more than this, because there isn't room for much more. However, 1-1.5 uF will do and current e.g. 1.0 uF/800V is 18 mm in diameter. Current 3.3 uF/250V from Jantzen Audio are 30.5 mm diameter and too large. Removing the electrolytic caps is a bit tricky as we can't get to the rear side of the circuit board, thus gently pull the caps over and pull out the termination of the capacitor as can be seen from photo above to the left. 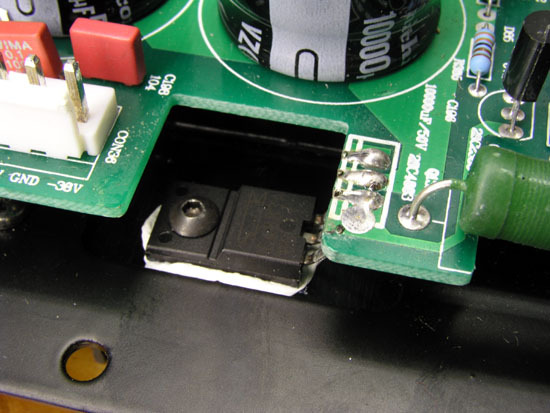 When the wire is exposed add your solder iron and remove the wires one by one. Use insulation on new cap wires to make sure not to short any components. If you're not used to this kind of tweaking leave it to a professional. It's not one of the easy tweaks. Take utmost care not damaging the circuit board! Last, but not least, only do this when operating the amplifier as a balanced power amp from an AC coupled line stage. 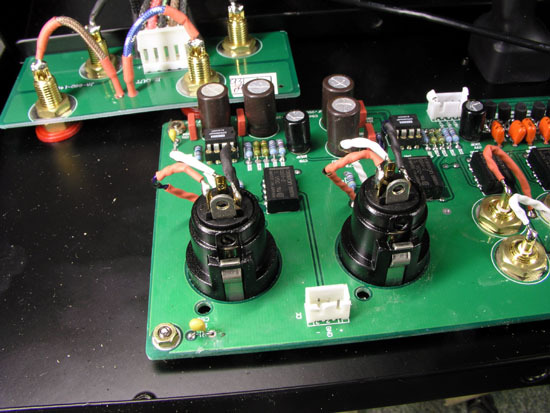 I did not add input capacitors to the board as I use a transformer coupled line stage. I don't know if the Jungson line stage is AC or DC and please do not ask. I don't know. I'm not an expert in electronics and can't provide further advise.